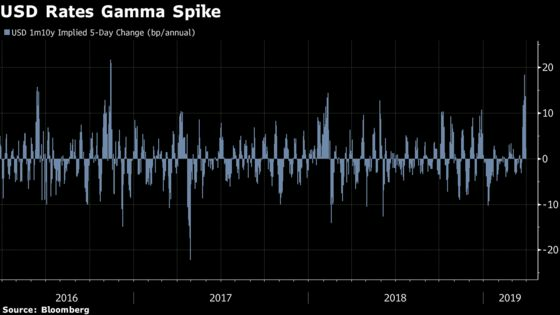 (Bloomberg) -- Price action and momentum drive flows in bonds, but from a tactical perspective it’s no longer compelling to chase the rally in 10-year Treasuries. The aggressive fall in yields should stabilize with confirmation needed from fundamentals, helped potentially by less convexity hedging flow. Harvesting value from short rates volatility on the 1m10y point has been an attractive yield enhancement strategy in recent years, with the lack of realized volatility of rates earlier this year having boosted short gamma positions. Ten-year yields declined as much as 26bps since before the March FOMC meeting, with receiving flows related to delta hedging short-gamma positions having helped compound the decline in rates (in addition to other negatively convex players, such as MBS investors). Any further fall in yields may not lead to an increased need to hedge these positions given it would reduce the negative gamma profile as the market moves further from the strike, reducing the appeal of chasing duration.